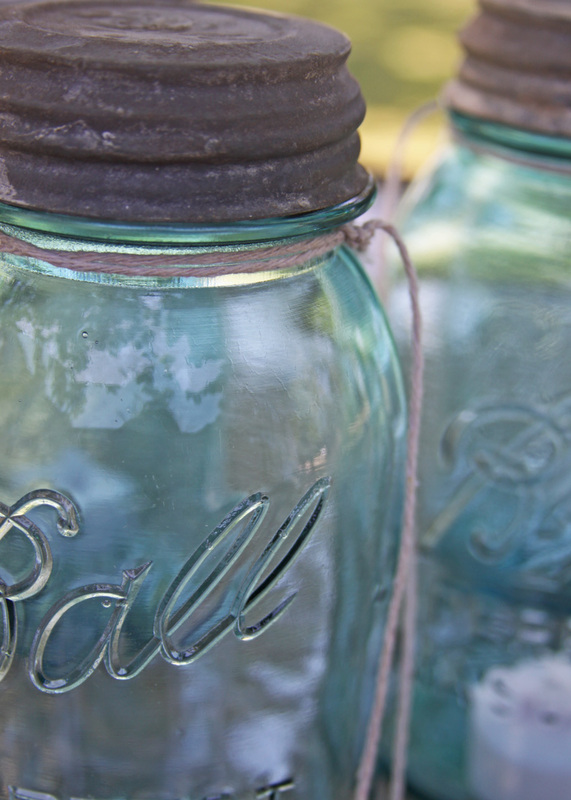 I love mason jars for decorating inside and outside of the house, and I simply cannot get enough of the pretty blue jars lit up at night with candles in the summer time. I have been experimenting with different ways to turn my blue Ball jars into outdoor lanterns, and think I have finally found the easiest way to do so. Thanks to timed tea lights my lanterns are now very low maintenance. 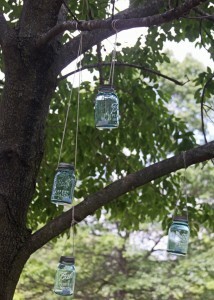 Last summer I used mason jars hung on a line of wire between two trees near our deck to illuminate our outdoor space. I loved the look of it, but found myself forgetting to put the covers on at the end of the night and letting the jars fill with water. I also felt like I was rushing around lighting and blowing them out every time we happened to be outside at night so I could enjoy them. For my birthday in April my very sweet husband ran around outside with a 10 foot extension ladder and hung jars in trees around the house and filled them with flame less candle lights. It was such a sweet surprise and I loved walking outside to see the little lights hanging from all of the trees. There was a problem, though. I wasn’t about to walk around the house each night with a huge ladder to turn the lights on and off for just a couple hours and because he forgot to put the lids on they got rained in before we took them down and the tea lights were wrecked. 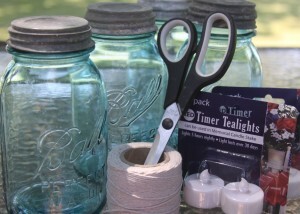 When I spotted timer tea lights at Walmart I knew I had the perfect solution to my outdoor mason jar dilemma. These are super awesome. You remove a tab on the bottom of the light at the time you want them to turn on every night, then they stay on for 5 hours. They will turn on and off by themselves at the same time each night for up to 30 days! I love that! I don’t need to do a thing, and each and every night I can look out and see my jars all lit up without having to light them myself. It has a nice ambiance while we are sitting out on the deck on a beautiful summer evening. They look great just hanging in the tree during the day too. 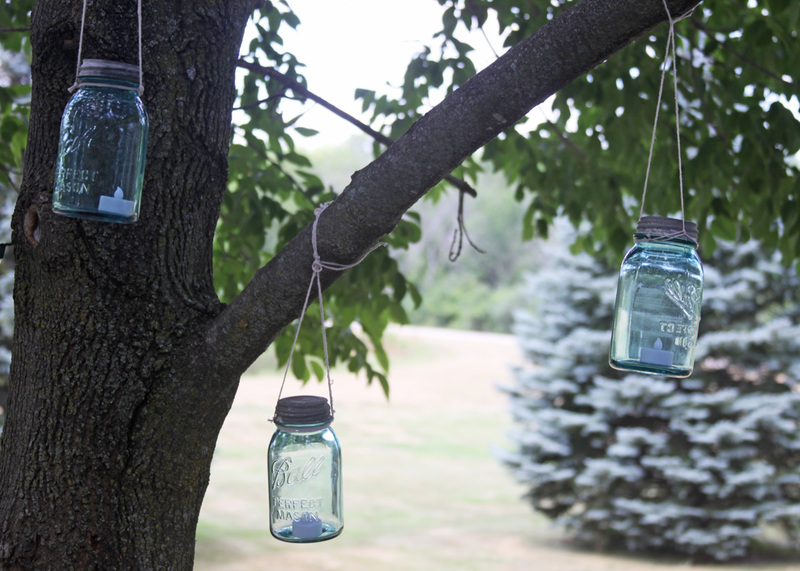 The beautiful blue colored jars tied with string to the branches of a tree is simple and beautiful. That was all the hubby’s idea and I was excited to try it with the timed lights inside. At night the little lights are the perfect touch. The four little lights in the right-hand corner of the photo are the mason jar lanterns. The other lights are a simple strand of white Christmas lights with a green cord attached around two trees near our deck. 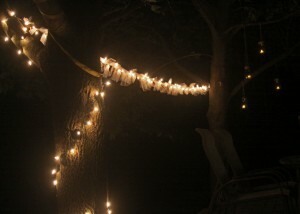 I cut small pieces of tulle and tied them along the string of lights for a soft glow around the space. 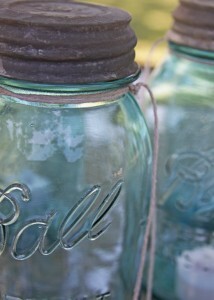 It looks great paired with the mason jars on a summer evening.